Is the Honors of War system working? 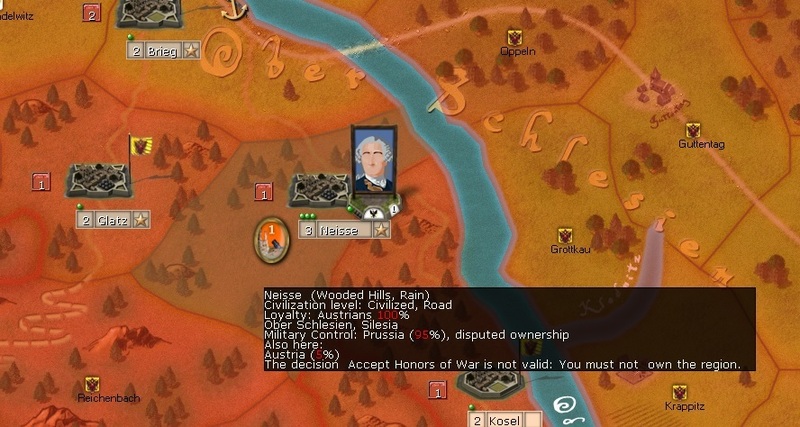 I am playing the Maria-Theresa scenario and the Prussians are besieging Neisse and offered Honors of War. the description seems a bit weird - why would I be able to accept Honors of War in a fort NOT controlled by me? Am I misunderstanding how this works? Can you post a save here? [ATTACH]22509[/ATTACH]Sure, here you go. This is two turns later than from the screen, but the Prussian HoW offer is still standing and I still can't accept. I believe the problem is in the too short duration, set to 1 turn only. We will fix that. Hi Pocus I played a bit of single player ROP gold last night and noticed the same problem, is there any chance of a hotfix today? UPDATE: Yep, HoW seems to work alright in the latest (and final?) version. Installing the 1.11 patch seems to have gotten rid of the odd AI behavior, when it comes to HoW. Thanks, guys! Sorry for the necromancy, i.e. resurrecting a long dead thread, but in the Steam version of RoP Gold, I am having this problem with the Silesian War scenario. I am guessing this was never fixed, correct? That not being able to use HoW in regions you can't own feels a bit counterintuitive. Again, sorry for resurrecting an old thread; I just wanted to confirm that the HoW system seems to be working fine now. I'm playing the Steam version (which is already updated to the last patch). This is just to reassure potential customers... Seriously, I only recently got into this game and can't recommend it highly enough! A fellow player and I had exactly this question, does Honors of War work. We both contrived to get into a situation where HOW was warranted. I can report - it works as intended including accepting the surrender.